Now for my dire warnings. If you attempt to make this or teach this you will be unsuccessful unless you release any attachment to thinking for yourself. Follow the directions precisely. Chances are you will not heed this warning until you have botched up the first few tries of making this. Oh well. I tried to warn you. Any students you work with should also be encouraged to work along with you lest their attempts fail. Precocious student will anticipate the next step, thinking that they see a pattern in the steps. These students will likely find themselves with a structure that is glued shut. I have a special name for this kind of mistake. I call it a bad Christmas present: it looks interesting from the outside, but it just won’t open. Can be funny, but ultimately it’s not something you want. I did not invent this structure. I don’t know the history of it, or what it’s called. I have seen it used a novelty gag, something that will hide or reveal a dollar bill. If someone knows its official name, I would be grateful to hear it. Only recently, when I had been exploring the folk toy known as the Jacob’s Ladder, did I realize that this structure is a shortened version of the Jacob’s Ladder. It seems fitting, therefore, for me to call it Li’l Jacob. I really like this name. Let me mention too that there is nothing special about the dimensions that I present in my instructions. 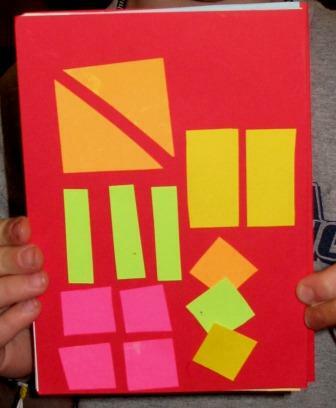 The squares can be rectangles. 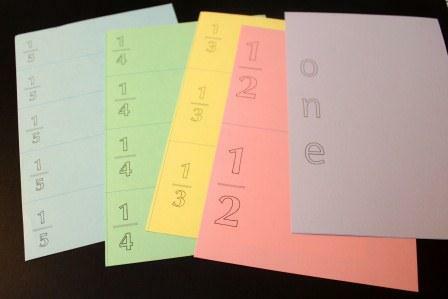 The strips of paper can be all the same width, or all different widths. The dimensions that I illustrated will be the ones that I will be using when teaching, so that’s what I based the tutorial on. 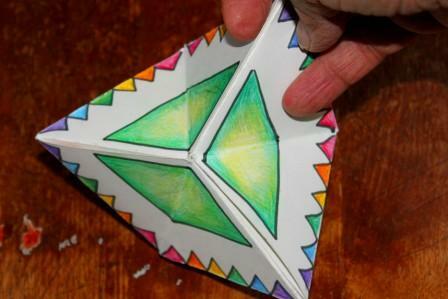 I’m looking forward to seeing how students react to this odd folding activity. If you try it out please please please let me know how it goes. Here’s the rest of what I started in my last post about this book with the narrow accordion spine. 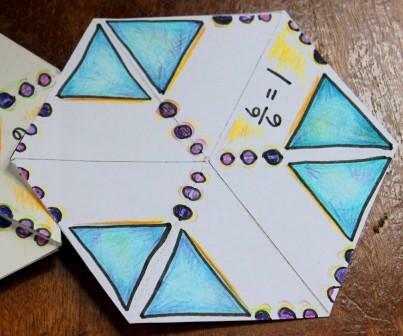 What I like about combining this structure with fractions is that it makes a concrete (ok, paper) connection between the relationship of different “families” of fractions to each other. 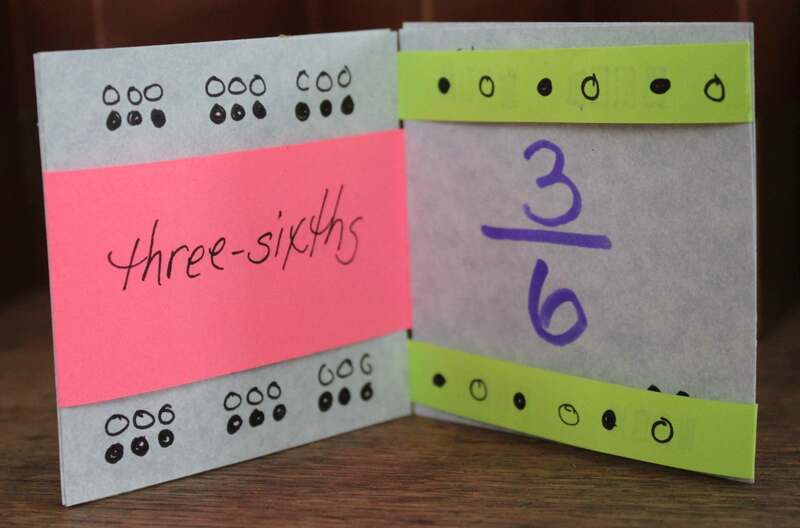 For instance, just by looking at the pages when the book is expanded, as it is in the photo above, it’s clear that two-fifths is bigger than one-fourth, and 2/2 is the same as 3/3. 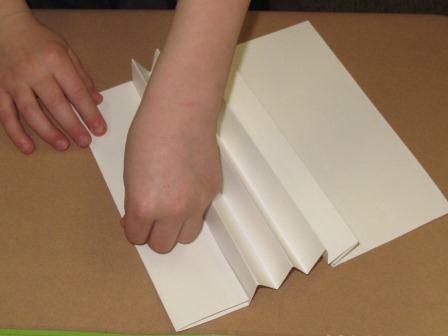 After making the accordion spine in the last post, there’s actually one more step, because I needed not four, but five accordion folds. 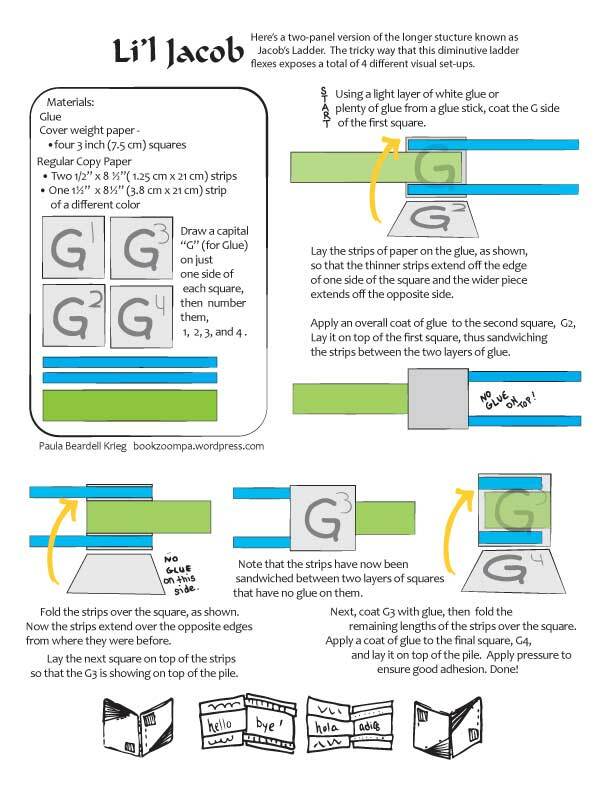 To make the fifth accordion, start by folding just one edge over to meet the closest crease. 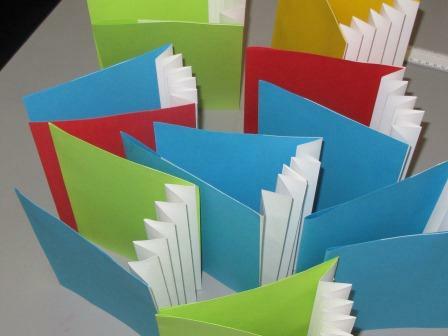 To make the fifth accordion pleat the students folded one of the edges to the closest crease, pressed down the fold then turned the paper over and brought the crease up to the master fold. Done. Now the covers go on…. …and the pages go in. 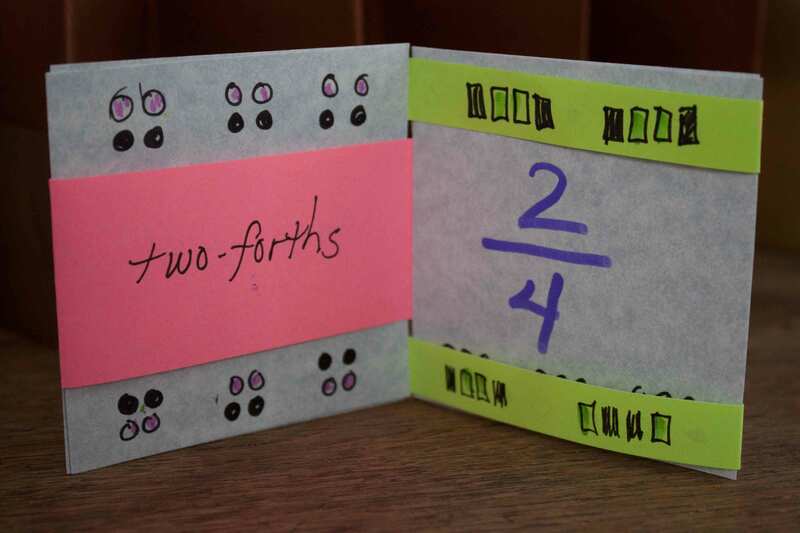 After a conversation with my wise special ed friend teacher, Melanie, I decided to label the left side of the pages with part of the fraction that each slice of paper singularly represents. 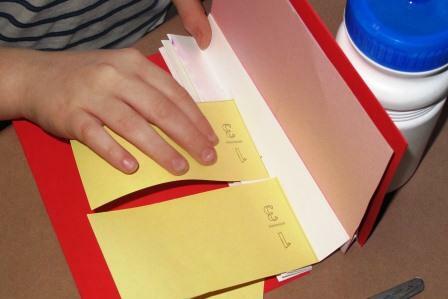 Students cut the papers to their appropriate sizes (on the lines that were printed onto the papers). This step, to my surprise, didn’t take long and went quite smoothly. There was the occasional leaking out of glue that made some pages stick a bit to each other, but that was easily fixed. 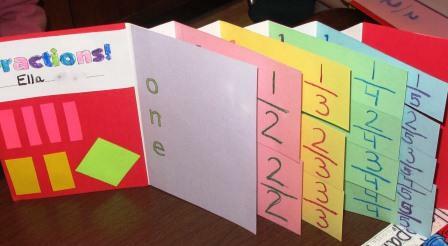 The students labeled the right, exposed edge of the fractions book, with the fractions written sequentially. 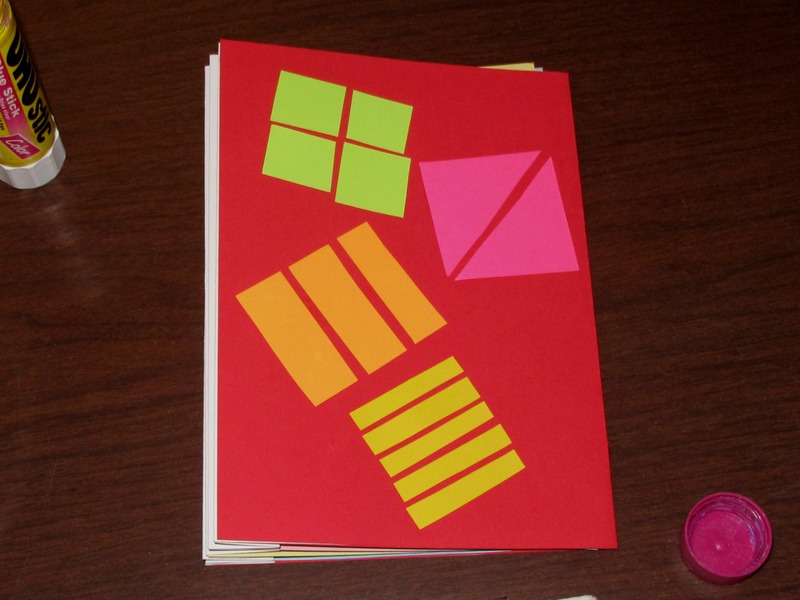 Now it’s time to decorate the cover, using 2 inch squares to cut into fraction pieces. 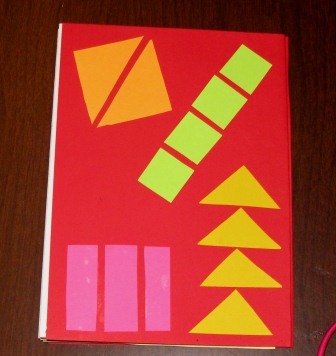 The only thing left to do, if they choose, is to write on the blank parts of the pages, perhaps adding in math facts. 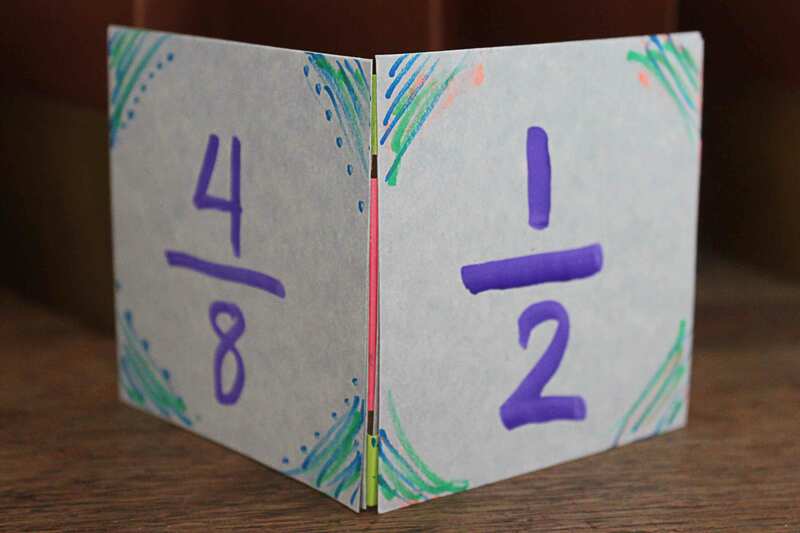 A big thank you to the teachers who trusted me when I said, hey, we can do a fractions book…I’m sure they had no idea what I was talking about. And it worked out so well! Everyone was happy. Except for the last picture, all of the images in this post exist on one hexagon-flexagon. 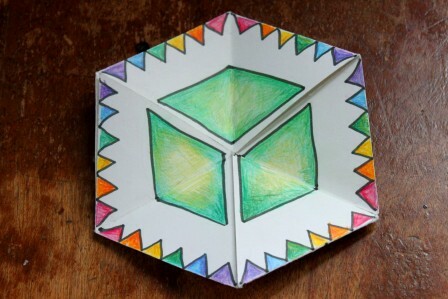 In my last post I showed hexagon-flexagons that were about making designs with pencil, paper, and gouache. When I was making the design for this post I was thinking more about math. 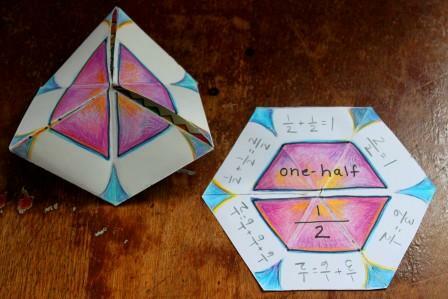 Okay, now here I go,showcasing my hexagon-flexagon as way to illustrate fractions, rather than to be a kaleidoscopic toy. The hexagon-flexagon above has been illustrated to be understood as thirds,showing that three thirds create a whole. Now, this concept might be better understood if the parts were actually labeled. Not bad. I like this way of working with the hexagon-flexagon. One thing is really clear to me, and that is that I would love to work with a graphic designer who would add words and numbers that looks snazzier than my handwriting. 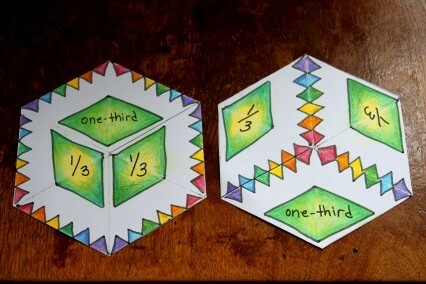 Oh, and another thing that is clear is that labeling the hexagon as two halves doesn’t work well after it’s been flexed. (I’m not providing a picture here of how the broken up halves looks). I think that this is going to be a long-term project, perfecting these images with better text graphics. I like how the geometric patterns work out here. It’s just the labeling that I can’t get right. So, everyone has heard students question why they have to learn math, particularly algebra and trig, as they don’t foresee ever using it. I have at least one good answer to that age-old question. 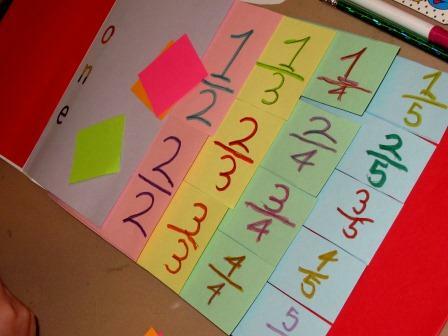 The reason to master math is that it keeps a person’s options open. I recently spoke to the someone who was helping her 30ish-year single parent daughter with Algebra because it is required for a nursing degree. Today I spoke a woman who has gone back to school to get a degree is Public Health. She is struggling with her required economics course. My son needs a to complete two semesters of Calculus towards his Biology degree, which will qualify him to go on to Chiropractic studies. So, there you have it: learning math a keeps options open for the future. 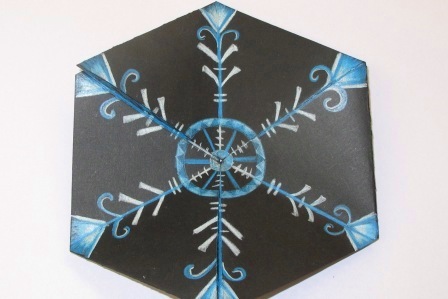 Now here’s another way of decorating a hexagon-flexagon, and hey, it’s even seasonally correct, as it can easily pass for a six-sided snowflake. 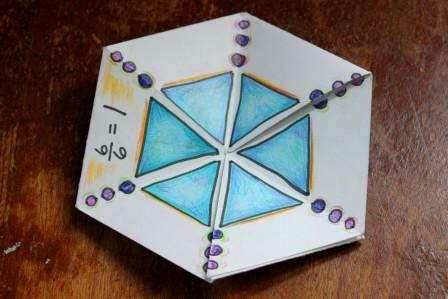 Math and art together: always a great idea.